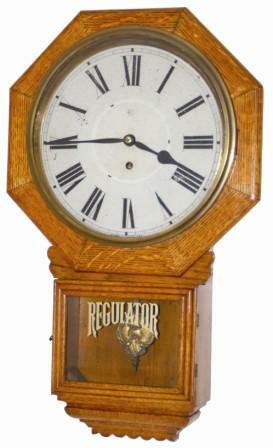 Waterbury Clock Co. short drop clock, "Edna", ca 1908. This 26" high oak case is a little different from most short drop clocks. It has some extra trim on the base and sides, and should have 8 medallions on the edge of the case near the eight points of the octagon bezel. They are all missing. If I did not have a book to reference I would not have known. The painted metal dial is signed, and overall in very good condition. Correct hands, good glasses and pendulum bob. Waterbury never skimped on labels. I have seen as many as four on one clock. This case has two fine labels on the back. The 8 day movement is time only, in very good running order. Ly-Waterbury No. 692.